These radioactive crystals, called zircons, are common in granitic rock. As a zircon crystal grows in cooling magma, it incorporates Uranium and Thorium atoms from the magma into its crystal lattice. After a zircon is fully formed and the magma cools some more, a crystal of black mica called biotite forms around it. Other minerals, such as quartz and feldspar, form adjacent to the biotite. Helium atoms are lightweight, fast-moving, and do not form chemical bonds with other atoms. They move rapidly between the atoms of a material and spread themselves as far apart as possible. This process of diffusion, theoretically well-understood for over a century, makes Helium leak rapidly out of most materials. Their results were remarkable. Up to 58 percent of the nuclear-decay-generated Helium had not diffused out of the zircons. The percentages decreased with increasing depth and temperature in the borehole. That confirms diffusion had been happening, because the rate of diffusion in any material increases strongly with temperature. Also, the smaller the crystal, the less Helium should be retained. These zircons were both tiny and hot, yet they had retained huge amounts of Helium! Many creationists believed it would be impossible for that much Helium to remain in the zircons after 1.5 billion years, but we had no measurements of diffusion rates to substantiate that belief. 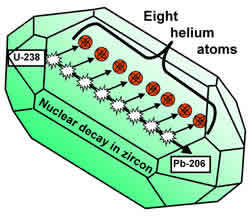 As of 2000 the only reported Helium diffusion data for zircons9 were ambiguous. So in that year, the RATE project commissioned experiments to measure Helium diffusion in zircon (as well as biotite) from the same borehole. The experimenter was one of the world's foremost experts in Helium diffusion measurements in minerals. In July 2003, just one month before the conference, we received a new set of zircon and biotite data from our experimenter. These data were much more useful to us, in three ways: (1) these zircons were 50 to 75 µm in length, (2) both zircons and biotite came from a 1490 meter depth, (3) the zircon diffusion rate data went down to 175º C. Items (1) and (2) mean that these zircons matched Gentry's exactly, being from the same borehole, rock unit, depth range, and size range. 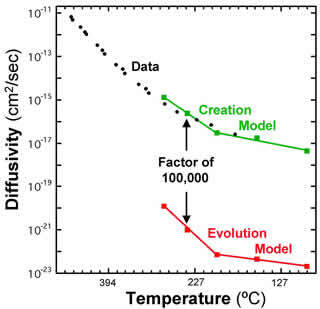 Item (3) means the diffusion rate data now extend well into the temperature range of our models. These new data13 agree very well with our "Creation" model prediction, as the figure shows. Moreover, the diffusion rates are nearly 100,000 times higher than the maximum rates the "Evolution" model could allow, thus emphatically repudiating it. The experimenter also accurately measured the total amounts of Helium in both the zircons and in the surrounding flakes of biotite. This ties up some loose ends for our case: (1) The total amount of Helium in the zircons confirms Gentry's retention measurements very well. (2) Our measurements show that the Helium concentration was about 300 times higher in the zircons than in the surrounding biotite. This confirms that Helium was diffusing out of the zircons into the biotite, not the other way around. (3) The total amount of Helium in the biotite flakes (which are much larger than the zircons) is roughly equal to the amount the zircons lost. Compare this situation to an hourglass whose sand represents the Helium atoms: We have data (from Uranium and Lead) for the original amount in the top (zircon), the present amount in the top, the present amount in the bottom (biotite), and the rate of trickling (diffusion) between them. That makes our case very strong that we are reading the Helium "hourglass" correctly. The new data allow us to calculate more exactly how long diffusion has been taking place. The result is 6000 (± 2000) years—about 250,000 times smaller than the alleged 1.5 billion year Uranium-Lead age. This and other exciting new developments in RATE projects are confirming our basic hypothesis: that God drastically speeded up decay rates of long half-life nuclei during the Genesis Flood and other brief periods in the earth's short history. Such accelerated nuclear decay collapses the uniformitarian "ages" down to the Scriptural timescale of thousands of years. RATE stands for "Radioisotopes and the Age of the Earth," a research initiative launched in 1997 jointly by the Institute for Creation Research, the Creation Research Society, and Answers in Genesis. See book in ref. 4, and numerous pages about the RATE project at www.icr.org. D. R. Humphreys, "Nuclear Decay: Evidence for a Young World," ICR Impact No. 352, October 2002. Archived at /articles/imp/imp-352.htm. D. R. Humphreys, S. A. Austin, J. R. Baumgardner, and A. A. Snelling, "Helium diffusion rates support accelerated nuclear decay," Proceedings of the Fifth International Conference on Creationism, (Pittsburgh, PA: Creation Science Fellowship, 2003) pp. 175-195. Archived at http://www.icr.org/research. p. 348, fig. 7. Book information at: http://www.icr.org. The 1.5 billion year uranium-lead date was consistent with uniformitarian geological expectations for the age of the Precambrian "basement" rock from which the zircons came. R. V. Gentry, G. J. Glish, and E. H. McBay, "Differential helium retention in zircons: implications for nuclear waste management," Geophysical Research Letters 9(10): 1129-1130, October 1982. Sh. A. Magomedov, "Migration of radiogenic products in zircon," Geokhimiya, 1970, No. 2, pp. 263-267 (in Russian). English abstract in Geochemistry International 7(1): 203, 1970. English translation available from D. R. Humphreys. See ref. 4 for the prediction. See ref. 3 for technical details. We plan to report these new data in detail in future technical publications, particularly in a paper to be submitted to the Creation Research Society, and also in the final report of the RATE project two years from now. *When this article was written, Dr. Humphreys was an Associate Professor of Physics at ICR. Cite this article: Humphreys, D. R. 2003. New RATE Data Support a Young World. Acts & Facts. 32 (12).